Lightly oil salmon and season with salt and pepper. Place on grill, cooking about 5-6 minutes per side depending on thickness of fish. 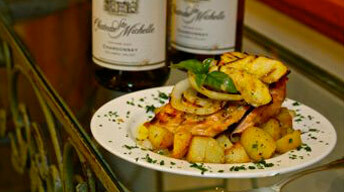 To serve: Divide potatoes between four entree plates; top each with a piece of salmon; drizzle sauce over the top; and garnish with grilled Walla Walla onions & apple. Place potatoes in pot and cover with cold water; bring to a boil over high heat. Reduce heat to a simmer; cook until potatoes are done when pricked with a fork. Drain and set aside to cool. Heat a small saucepan over medium-high heat. Add butter and shallots; saute until golden brown. Stir in chopped apples; saute for 1 minute then add riesling. Continue cooking until liquid is reduced by half. Add stock and again reduce liquid by half. Add cream; continue cooking until sauce has thickened. Strain sauce and return to the pan. Season to taste with salt, white pepper and cider vinegar. In small sauce pot, bring water, sugar and juice of ½ a lemon to a boil. Reduce heat to a simmer; add apple wedges and cook for 1 minute. Remove and drain well. Toss apple with a little oil to lightly coat. Brush onion with oil. Place apples and onion on grill. Cook apples just long enough to mark each side; transfer to a platter and set aside. Cook onions until cooked through; Transfer to platter and set aside.